Maintaining a robust IT infrastructure capable of supporting the rapidly changing semiconductor and display industries is an ever increasing challenge. As part of Applied’s strategy to help employees better communicate and collaborate, and be more productive, we've leveraged a number of advanced IT technologies throughout our organization – both employee-facing and in the back-end. Central to our efforts has been our close collaboration with Cisco. Hari Jayaram (right), Applied Materials VP of Enterprise Infrastructure Solutions and Support, presents the IT Supplier of the Year award to Sylvain Tremblay (left), VP of Commercial Sales at Cisco. 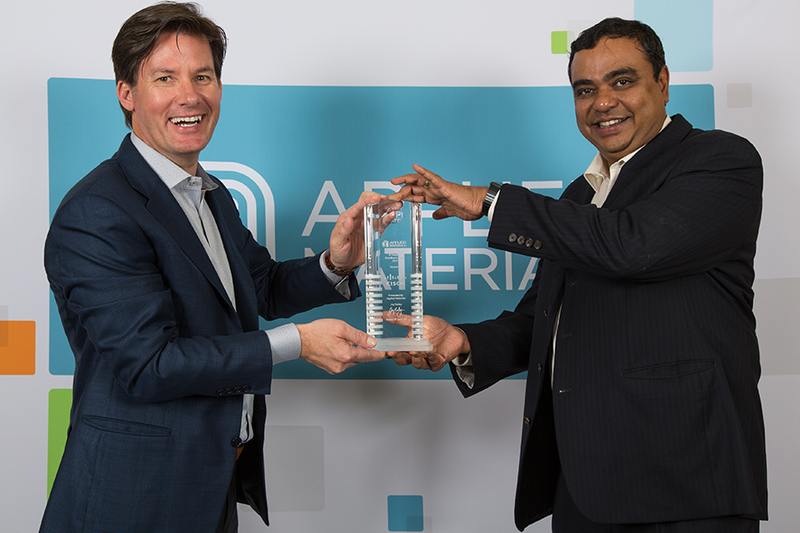 Cisco's partnership, support and continuous delivery of new innovations have earned the company the first Applied Materials IT Supplier of the Year Award. The award recognizes Cisco’s role as a strategic IT supplier that excels at enabling employee productivity, collaboration and innovation. Utilizing a variety of Cisco technology, Applied’s network architecture has evolved into a strategic platform capable of supporting a dynamic business ecosystem. The Applied Materials IT Supplier of the Year Award recognizes an IT supplier who has excelled across a variety of performance criteria and had a strategic business impact. Suppliers interested in learning more about the award should reach out to their IT contact at Applied Materials.